For more than 25 years now, we have been testing the properties of gaskets, calculating strength and measuring bolt forces. Using this experience, we have developed a procedure to ensure reliably leak-free joints in 5 simple steps. By systematically implementing these steps, even the very highest requirements for bolted flange joint tightness can be adhered to safely. First of all we observe the occurring or expected loading, such as temperature, internal pressure or connection loads, and their behaviour with time. If necessary, we measure the actual loading characteristics on the components. The flange, bolts and gasket are adjusted to the loads, depending on the geometry and material selected. We use gasket characteristics (which we are able to determine in our test laboratory) to make a reliable gasket selection. The calculation of flanged connections includes proof of strength and tightness. For this purpose, modules of our software TEMES fl.cal are available which comply with DIN EN 1591-1 and KTA 3211.2 (Nuclear Safety Standards Commission), and of course which are also able to determine the assembly specifications. We use finite element analysis for special cases which cannot be visualised with analytical processes. 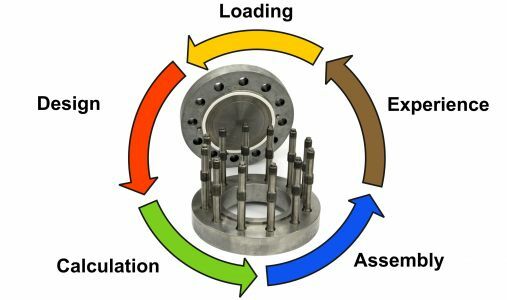 Only with high-quality assembly can the theoretical design of a flanged connection be implemented correctly in practice. When tightening bolts, the friction in the bolt threads and/or under the bolt head results in a wide distribution of the bolt force actually applied. This is why we use hydraulic clamping fixtures for higher quality requirements, as well as various systems for measuring bolt forces. Often, the knowledge required to correctly design the flanged connection can only be gained on-site. The store of experience gathered in this way is most effectively collected in a database. If, as well as this experience, the parts used and the assembly values or resources are also recorded in the database, the operator possesses a comprehensive tool for Life Cycle Management.